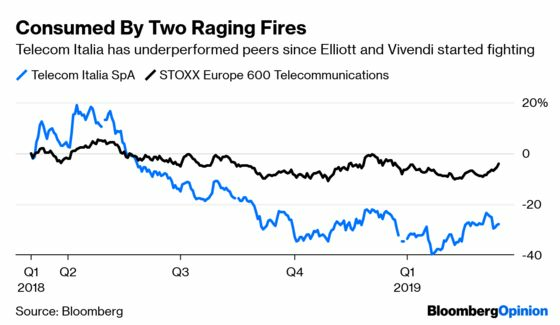 (Bloomberg Opinion) -- In the year-long battle between Telecom Italia SpA’s two biggest shareholders, the temptation is to invoke Mercutio and declare a plague on both houses. Unfortunately, investors in the former Italian national carrier don’t share that option with Romeo’s ill-fated lieutenant. Come the annual general meeting on March 29, they will need to back either the slate of directors proposed by Vivendi SA, the biggest shareholder, or the incumbents supported by activist Elliott Management Corp. Both parties have spent recent weeks flinging vitriol in the other’s direction in a series of papers, in each case focusing on perceived corporate governance shortcomings. There will surely be more to come. It’s all a red herring – both sides fall short. However, Elliott looks to be the lesser of the two evils. The debate needs to focus on two factors: the company’s operations, and whether to sell control of the networks business. Elliott, run by Paul Singer, is in favor of the latter. This dovetails with the government’s desire to create a single national fiber network by merging the division with Open Fiber SpA, a joint venture between Cassa Depositi e Prestiti SpA and utility Enel SpA. Given that Italy has a 9 percent stake in Telecom Italia through CDP, some kind of network sale increasingly looks like a fait accompli. Vivendi has always opposed this. However, Chief Executive Officer Luigi Gubitosi’s plan to return the company to growth nevertheless seemed like something that Vincent Bollore, the billionaire who controls Vivendi, could support. That is admirable, considering Gubitosi got the job in November at the behest of Elliott in a boardroom coup that left the French firm’s man out in the cold. Crucially, the veteran Italian manager’s plan isn’t predicated on a divestment of the network. And yet, Vivendi has failed explicitly to back Gubitosi, while suggesting little in the way of alternatives. 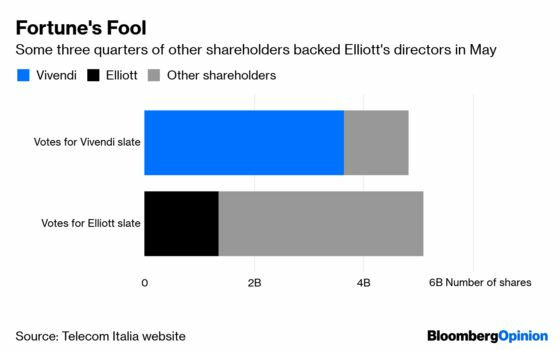 That’s why Bollore committed a strategic error in focusing the debate on issues of governance, because it makes it easier for Elliott to highlight Vivendi's own failings. When it controlled the board, it seemed clear that the French firm had motives that that tied into its own strategy, such as building a Netflix Inc. rival in southern Europe, with little regard for other shareholders. The Telecom Italia vote should really be a referendum on the networks deal, but Vivendi has failed to make it as much. There are risks to selling control of it. Erstwhile CEO Amos Genish, who is close to Bollore, was adamant the division was essential to the rollout of next-generation 5G networks. It’s also traditionally been more profitable than other parts of the business, though it is going to need major investment. He may be right. But after a lost year where the stock hemorrhaged 34 percent of its value, at this stage it needs to stick with Gubitosi’s turnaround strategy, which involves teaming up with rivals on parts of the network and reducing debt. A vote for Vivendi looks like it would risk another CEO change. That’s the last thing shareholders need. This is where Vivendi has severely misplayed its hand. Its best bet for securing support from other investors might have been to back Gubitosi while pledging to retain a majority stake of the network. Investor faith in the French firm looks slim: 75 percent of other shareholders voted against appointing its directors less than a year ago. Vivendi has done little to alter its image since then, instead pointing solely to Elliott’s failings. Its appointees’ main responsibility should now be to ensure that the company gets the best deal for the network it can. With a little under two weeks to go before the vote, there’s plenty of scope for more sniping. But shareholders need to blank out the noise and seek hard answers to the operational and strategic questions, and Gubitosi already has such a plan. Seldom was there a story of more woe than Luigi, and his telco.